Posted by Rutger on 2011/08/19 . Leave a comment. Twelve years ago the last Stockholm Water Festival was held. The first Water Festival was held in ’91 and, although it was initially propelled by the best of intentions, it soon fell into an abyss of generic content and fast-food stands. This weekend, the Floating Lawn will perform as the base and platform for a water-festival-as-it-should-be: Spontaneous, low-key, and fun! 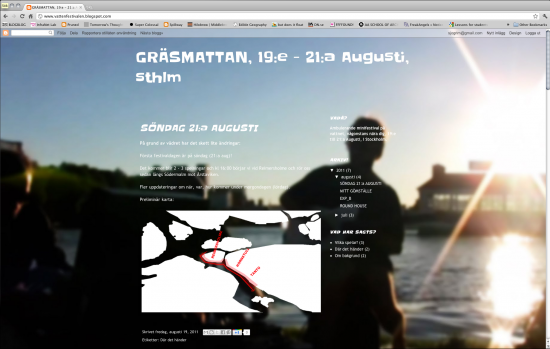 Join us next to the water at, Reimersholme, Horsntull and Tanto in Stockholm, this sunday. We start at 15:00.